Figure 1: Blue Village, a three section cut town with peaked roofs, photo courtesy of the Betsy and Charlie Zukoski collection. 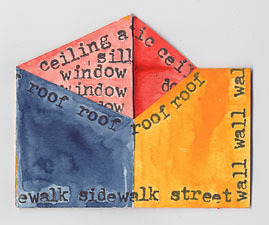 The origami booklet is an easy form with many possibilities for variation. The basic pattern is simple. 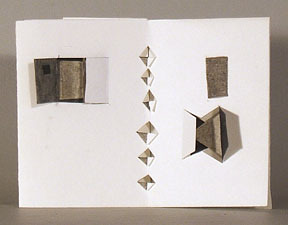 Figure 2: Layout for a four page origami book. Fold a rectangle of paper into eight sections. Press the folds back and forth a few times. Fold paper in half in the short direction. Cut or tear along the center two sections of the fold OR cut unfolded with an Exacto knife. Fold in half in the long direction bringing the top edge down to the bottom edge. Hold at the left and right edges. Push towards the middle so the two center panels separate and form a cross. 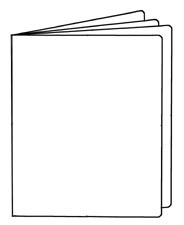 Flatten each page, then fold the rectangle of pages in half to form the booklet. This basic form is easy to copy for multiples such as a show invitation or brochure. Figure 4: Santa Monica inside. 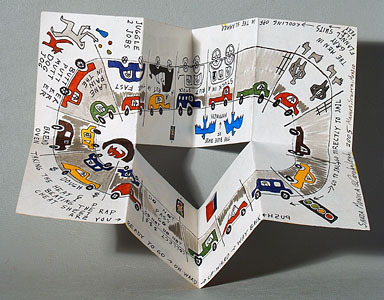 The outside is illustrated in A Studio To Go, artist's book travel supplies for a portable studio. One variation utilizes the inside of the booklet. In Santa Monica, the freeway/game board inside unifies the space and contrasts with the quiet beach boardwalk scenes on the outside. There is a cutout window in the beach scene to reveal more content inside the booklet. I use this format like a dos-a-dos, to compare and contrast. 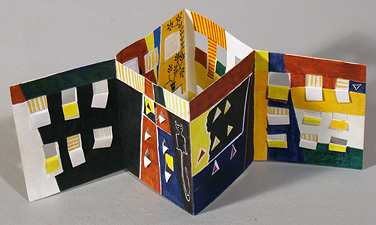 Figure 5: The booklet is a good format for making pop ups and paper cuts. Figure 6: Another variation is small "buildings". Chico's Place is a Matisse inspired interior/exterior. The "window" flaps fold over to hold the end sections together without glue. 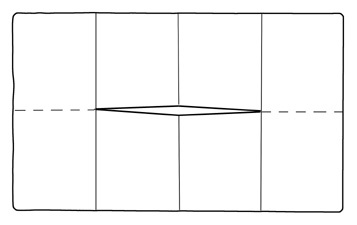 Figure 7: Two section cut layout. Many different forms may be cut in the center besides the straight cut. This is a two building, peaked roof cut. 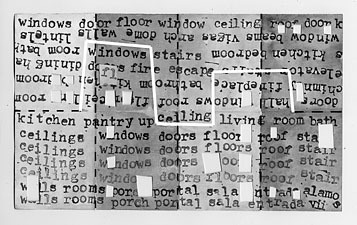 Figure 8: Two building cut folded into page format. Figure 9: Three section cut layout. The three section cut makes an interesting book sculpture. The sections must be planned to have enough strength when the book is expanded. 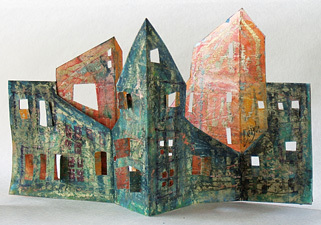 Figure 10: Three building cut folded into a 3-D book sculpture. Other possibilities include angling the horizontal fold and making the vertical folds at unequal intervals. Another variation uses a longer sheet of paper and folded into more sections. Twelve sections fold to eight pages, sixteen sections fold to twelve pages and so on. Cut through the center as before, leaving the end sections uncut. This idea is from Peter McHugh in Eric Kenneway's book, Complete Origami. He used them to write long letters to friends. 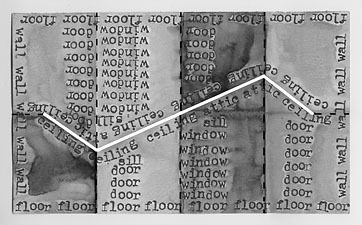 Carol Barton makes her small book into an ornament in her National Museum of Women in the Arts 2005 article. Sheren La Plantz shows a number of more complex folds and cuts in her book, Cover to Cover, pp. 92 - 95. 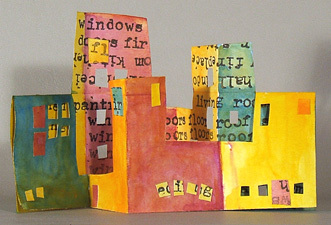 Carolyn Leigh is a traveler, painter and book artist based in Tucson, Arizona, USA and Alamos, Sonora, Mexico. First published: Ampersand, the Quarterly journal of the Pacific Center for the Book Arts, Fall 2008.